Seventeen Cache Hikers joined this pleasant Saturday hike: Dave W. (the leader), Scot, Jane, Carol, Todd, Linnette, Denis, Joe, Sun, Caroline, Betty, Terry, LaVae, Gordon, Kip and Jim met at our Logan assembly area, and Stephanie joined us shortly after we started hiking. As usual, we formed carpools to ease congestion at the parking area and and drove the short distance up Logan Canyon to Guinavah Campground and the trailhead near campsite 29. 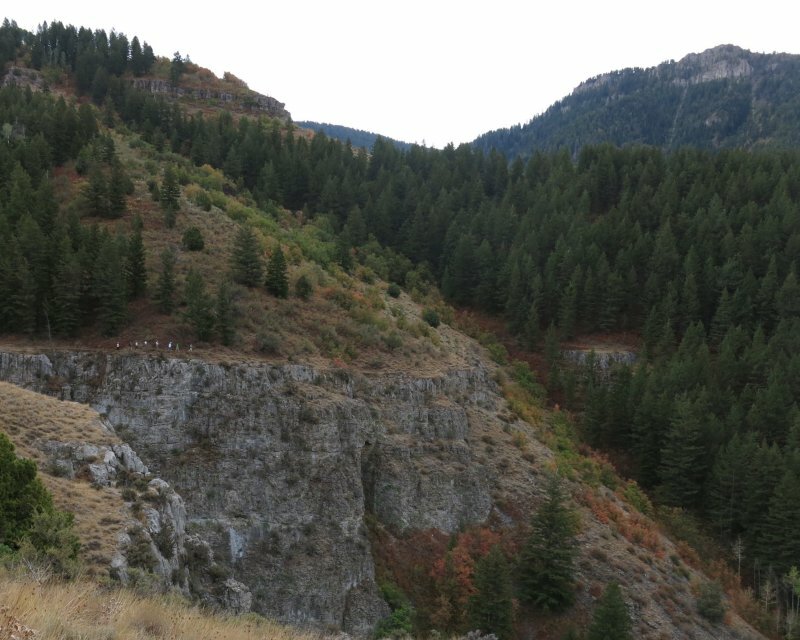 The trail climbed steadily for most of the first mile, past a junction with the Riverside Nature Trail, then switching back as it ascended a dry open slope before the shady section below the cliffs. Some of our hikers took longer to climb this section, but we kept in touch by walkie-talkie and the group rejoined on top of the China Wall cliffs. 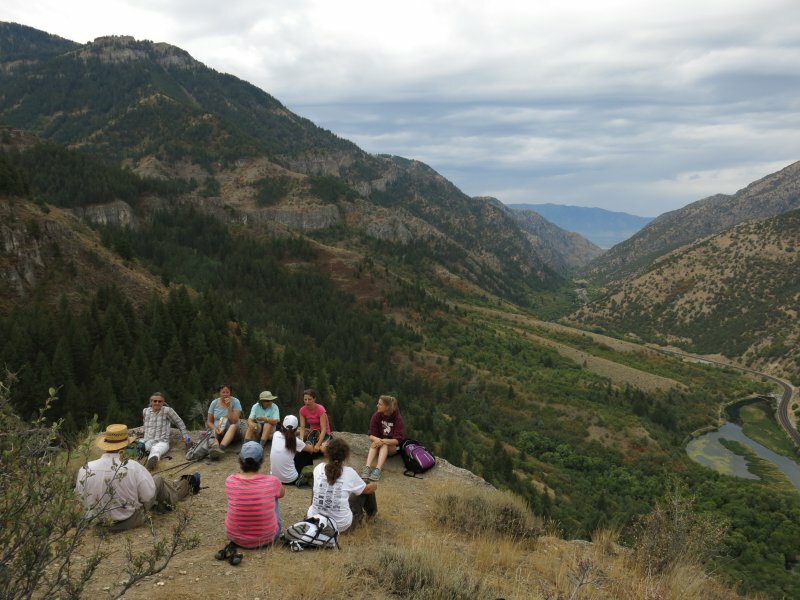 We rested and ate a late-morning snack on top of the cliffs as we enjoyed great views of Logan Canyon, Cache Valley, Spring Hollow and the Wind Caves. 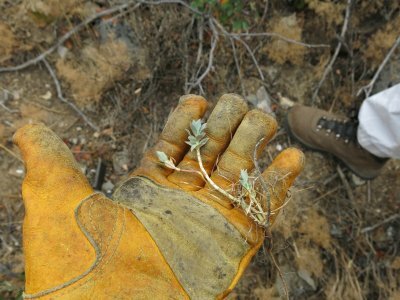 Dave W. showed where an infestation of myrtle spurge, an invasive and toxic plant, had been discovered. 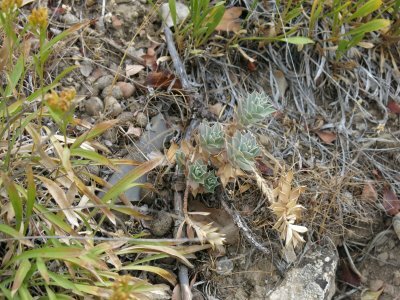 He took advantage of the opportunity and weeded the dozen or so plants we found, survivors of an ongoing attempt to eradicate them from this site. 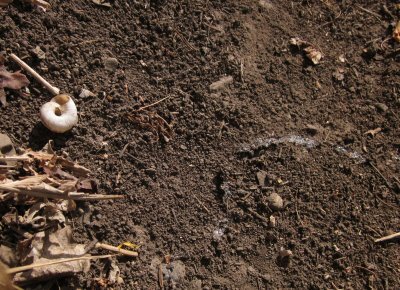 On our descent into Spring Hollow we spotted glistening slime tracks on the trail, evidence of recent snail activity. 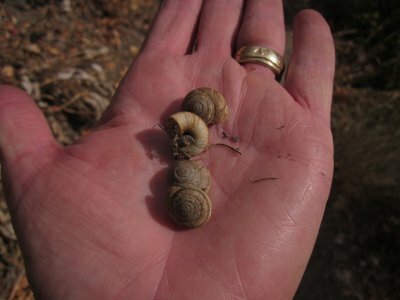 A little poking around under leaves revealed the living gastropods - Rocky Mountain Land Snails. We also encountered another weedy survivor as we approached the Spring Hollow trail - poison ivy plants that were sprouting back up after an eradication attempt earlier in the summer. 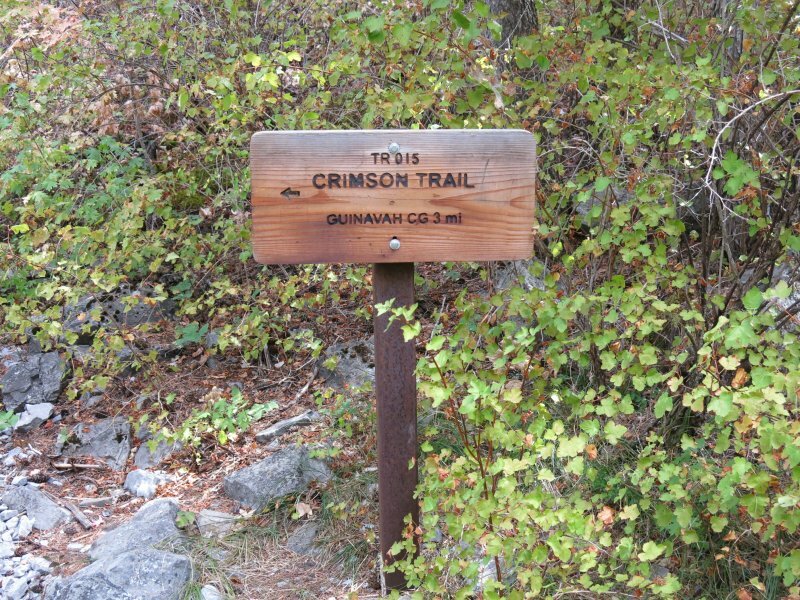 Thanks to recent Forest Service activity, there are new wooden trail signs at the Spring Hollow -Crimson Trail junction. The group continued down to the Spring Hollow Campground, then back to our starting place at Guinavah Campground via the Riverside Nature Trail, returning to Logan at 1:15. Our hike totaled 4.8 miles: 0.9 miles with 1000 feet of climbing from Guinavah to the cliffs, 1.3 miles along the top of the cliffs, 1.3 miles down to the Spring Hollow campground, and 1.3 miles along the Riverside Trail to Guinavah. Skies were cloudy, but we did not get rained on in spite of a 30% chance of precipitation.